Do you spend every morning packing lunches for your kids? If you’re anything like my family, you do. On top of that daily hassle, we have to get creative – packing lunches for picky eaters! We have been creating lunches for 6 years now. I know, how have we not figured out how to do this? 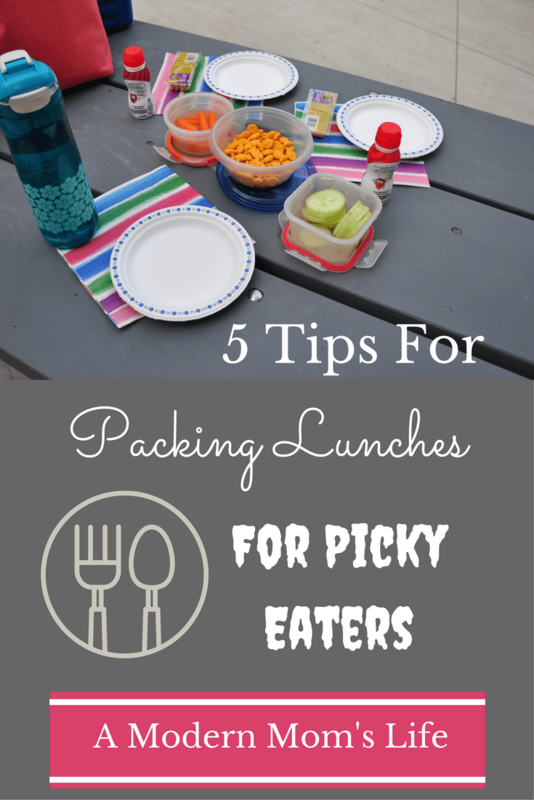 Well, I’m going to share a few things we do that makes packing lunches for picky eaters a little easier. The first thing that really helps us is a great lunch pail. The ones we bought for the girls last year (yes, a full school year ago) are still holding up amazingly! They are from Roots (no affiliate for me there) and they have a zip out plastic liner you can just toss in the kitchen sink and wash. There have been many days where items have come home half eaten, with a mess in the lunch pail. Being able to take the liner out is a lifesaver! There is also a velcroed section to hold the ice pack that came with it. They also came with a shoulder strap inside the front pouch so you can wear them as a bag if you don’t need the full backpack on any day. Soup is a great way to get veggies into picky eaters. We had to go buy a thermos because Emma decided she would eat soup for lunch occasionally. We invested in a good one and we got 2, in case Rose decides she’ll eat soup too. We pack a lot of various “snack” lunches. A container of veggies (carrot sticks for Emma, cucumbers for Rose), a yogurt drink, applesauce, some actual fruit for Rose, sometimes cheese (individually packaged, like cheese strings. My kids say regular cut up cheese goes “weird” when it’s in the lunchpail ALL DAY! ), plus something fun like granola bars or owls. We’ll try to have rice cakes, crackers, and other nut-free snacks to change it up during the week. Bento box style containers would work well for this kind of lunch. Be sure you get some labels to make sure all those containers come home. Mabel’s Labels offers different packages and personalization to help you get just what you need for your family. For us, we create labels with just our last name, so anyone can use the containers and water bottles. So far it works great – we’ve recovered water bottles from school and dance class! When Emma was younger, she went through a stage where she loved tortillas folded over with cream cheese inside. She also used to take toasted and cream cheesed bagels, but she grew out of that stage as well. I’m all for taking advantage of whatever the picky eaters will eat for lunch. I am happy if either of our kids wants to eat the same thing for lunch every day – as long as they eat it! Tell me you sometimes struggle packing lunches for picky eaters. It can be so exhausting trying to come up with something they will eat – and keep eating! Would you share some (nut-free) tricks you may have for the dreaded task of lunch packing? I am open to just about anything at this point. Make sure you follow along with me – I love sharing tips we’ve learned along our parenting journey! Some nice ideas there, thanks! My kids have been thinking about switching to packed lunches, recently. The trouble is, I’m not sure whether they would get bored with sandwiches, so it’s nice to get some ideas. It’s a real learning curve, packing lunches. If you go that route, I wish you all the luck Rachel! Hi Jess, keeping packed lunches interesting can’t be easy, and I totally agree that as long as they eat it does it really matter if they have the same every day? The school day finishes at two o’clock here so I never really worried about packing too much, it was more of a snack to keep them going until they got home and we had lunch…. I do like the soup idea, aclever way to get more veg into them and keep them hydrated. My girls finish school at 2:30, but since we can’t collect them until 5 or 5:30 we have to be sure they have enough food for the day! I’d love the idea of them coming home and having a real lunch! Glad I could hope! I take a lot of frozen leftovers (spaghetti dinners, casseroles etc.) and heat in the microwave at work. It works for me! Thanks for the tips! Making a lunch is such a challenge around my house. I have two boys, ages 3 and 6. They use to eat anything I would pack for them, and as they have gotten older, they have become picky. Packing lunch is definitely not my favorite thing to do. I hear ya Kendi! I hope you can take away something useful from my post! I read so much about picky eaters – I’m not convinced she’ll “grow out of it” or at least not while she’s still under my roof. Somehow the soup is still working for us though, so I’m just going with it!